East side view of the new north wing at GSS Albion Wolf Home. Finish work is well underway inside the new north wing at GSS Albion Wolf Home. Curtis Baetz of RMV Construction, general contractor on the project, said Monday he is hoping for substantial completion of the new facility within three weeks, or by mid-February. “We are cautiously optimistic that we can have a final walk-through by mid-February,” said Karen Glesinger, GSS Albion administrator. The new building must also pass inspections by the Nebraska Department of Health and Human Services and other agencies before residents can move in. No move-in date has been scheduled as yet, Glesinger said. 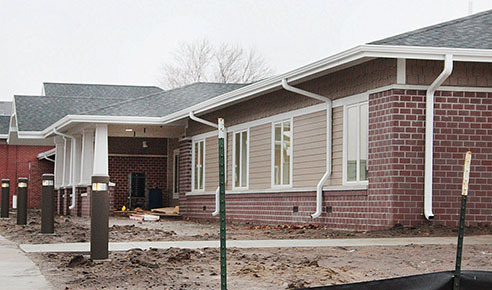 An open house will likely be scheduled at the new wing after move-in is completed. A substantial portion of the funding for the $3.3 million wing was raised through an area wide capital campaign over the past several years. Read more in the Jan. 25 Albion News Print and E-Editions.